When it comes to buying football gear, your football helmet is the most important investment to make. With all of the concussions and reprecussions of head injuries in football today, the last place you want to cut corners is when buying a football helmet. 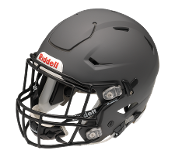 It is important to be educated and have a proper fit combined with the best technology when choosing the best adult football helmet for your playing situation. At Endzone Sports we take head protection seriously, thats why we stock what are believed by many to be the best football helmets available to allow our customers to attack the gridiron with confidence. Football has evolved from a contact sport to a collision sport and as these changes have come to fruition the best helmet manufacturers have adjusted accordingly with advanced technology. That is why we offer their football helmets. Shop our selection knowing that all of the adult football helmets you choose from us are NOCSAE approved and worn in high schools, colleges, semi pro leagues and the NFL. In addition to offering head protection, every player knows that your football helmet becomes a trusted part of your game. The way your helmet looks combined with the way it feels and protects you can make or break your game. When you take the field and are comfortable and confident in your helmet, you perform at your optimal performance level. The best football helmet for you depends on many factors such as size, comfort and the shape of your head. The best helmet for your buddy may not be the best football helmet for you. 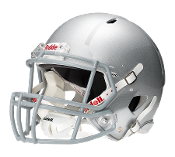 The most fool proof way to choose the best helmet for yourself is to measure the circumference of your head and compare to the sizing charts provided for each specific adult football helmet. Based on those references, choose the helmet that you feel is the best fitting and prtecting. Take your pick from the many variations of Schutt and Xenith Helmets we offer. As always if you need help choosing feel free to give us a call and we will use our football helmet expertise to guide you in the right direction!